Another day, another gadget that amplifies headphones, but this time with a silly name. 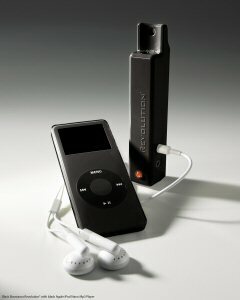 Meet the Boostaroo Revolution High Definition Headphone Splitter & Amplifier. Claimed to boost volume levels by up to 400 percent, the Boostaroo Revolution will have no problem making all your hot beats loud enough for everyone on the subway to hear. Or, if you just want to share your music with that special someone, just plug in another set of headphones and hand 'em over. I tell you, nothing wins over a girl's heart quite like a little Nas. Well, the Boostaroo Revolution looks nice (only $50, too), but do people actually need their headphones' volume to be boosted that high? Aren't you afraid that you'll damage your hearing? From the Duh section of today&apos;s Gray Lady.